TAX RUSH: Honolulu residents scrambled to make the midnight deadline for taxes at the main post office at Honolulu Airport. U.S. 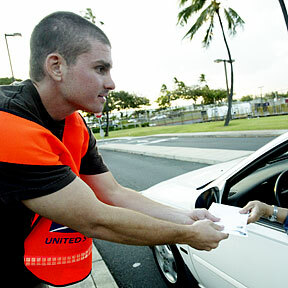 Postal Service worker Bruce Burke-Bartholomew collected tax return envelopes at the curbside late yesterday afternoon. The survey piece ranks the senator among the five worst who are falling short. Zephyr Insurance will no longer issue new policies for certain homes in Hawaii. People learn to cherish vintage garments that once were discarded. His Saturday performance was considered the best in the league and country. Six weeks of storms pound home a hard lesson. A 12-page Star-Bulletin special section from the Sun., April 16, 2006 edition. False Internet rumors drive the per-share price up to 85 cents. A city liquor inspection supervisor and Aloha Stadium's security chief have been indicted on extortion charges.